Angela Yosten: Thank you, Me and My Sister Designs!!! Thank you, Me and My Sister Designs!!! I just wanted to say thank you on behalf of the Marketing dept at Moda Fabrics. 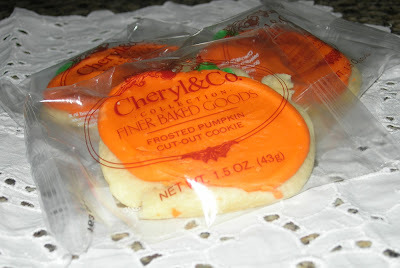 Me and My Sister Designs sent us these wonderfully, yummy, pumpkin shaped sugar cookies from Cheryl & Co. yesterday. Luckily, I was able to share in eating these yummy cookies since Friday is my to go into the office. They are delicious! So, THANK YOU very much! You girls are awesome! BTW... love the new collection coming out this market! Very cute! They look so Yummy and they are individually wrapped! Red Riding Hood Jacket GIVEAWAY !!!!!! !